Since time immemorial, curved elements in buildings have been used to create superior aesthetics. These curved elements not only carry an inherent strength but are also pleasing to the eye. Curved balconies, curved top windows and doors, curved walls, domes, ellipses and spiral stairs are just some of the elements used by architects to enhance the building they are designing. It is interesting to note that in the modern age, where budget and cost are many times a main driver in design and chosen solutions, that these curved elements are often discarded or ruined by introduction of “facetted” curves rather than good old “round” curves. With the industrialisation of the building industry, many companies have become proficient in producing quantities of standard “flat” elements including glass. These industries cannot cope with curved elements and when curved glass and other elements are introduced this creates a “hiccup” in the system as these cannot be industrially done. Effi Wolff joined his father’s company in 1993 after his military service. 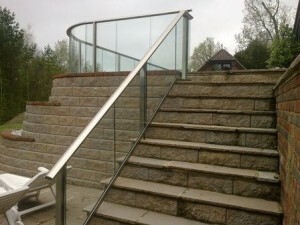 The company had been successfully creating glass banisters and balustrades in Israel since it’s formation in 1984. After eleven years, in 2004, Effi brought the concept to the UK. Bringing innovation to the already popular trend, he was able to bring down the cost per unit, even when making customs sizes and shapes. The company took off and is now the leading UK manufacturer of glass balustrades and Juliet balconies, as well as curved patio doors and windows. What are the handrail systems made from? We get asked are the handrails made of stainless steel? The answer is no, they are made from something better than stainless steel. They are made from anodised aluminium. Stainless steel is correctly named in that it stains less, but anodised aluminium is actually more corrosion-resistant, and that’s why we use it. We get asked a lot, how are the handrail corners joined together? An internal corner bracket is screwed to the handrail with screwed plate and pan to covered plate. The handrail corners are fixed together mechanically by way of an internal corner bracket premade to the correct angle. Each side of the handrail is screwed into the plate through the prefabricated holes on the handrail ends. On the Balcony 2 system it is then hidden by a cover plate. 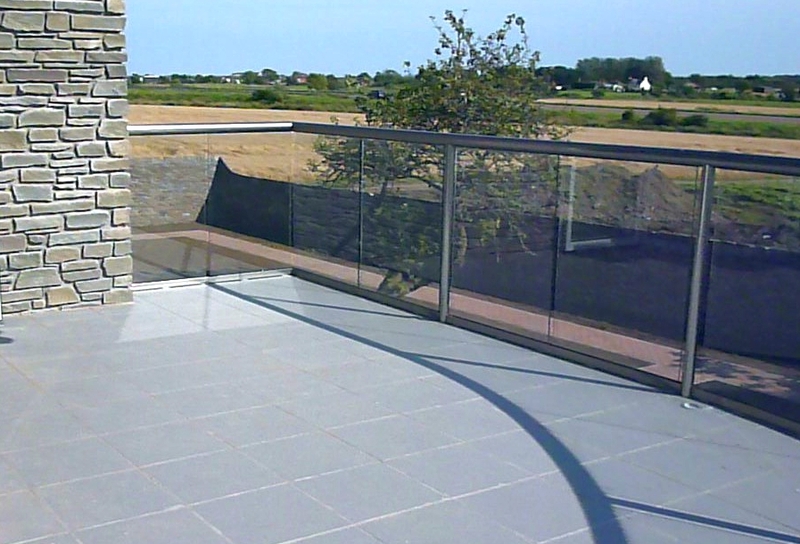 How do the Balconette glass balustrades system posts work? We get asked about the posts in our balcony systems, and how they work. 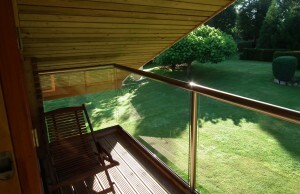 Balcony’s Royal Chrome Balustrades – Seven years later, how have they fared? 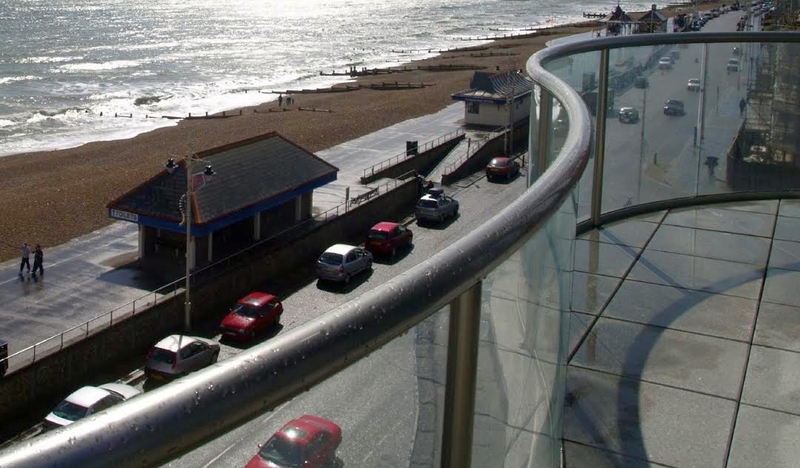 Constructed in 2007 and fronting directly onto the Bognor Regis seafront, the five-storey Compass Point building comprises 24 luxury two-bedroom apartments, each with its own large balcony or terrace to make the most of spectacular sea views. 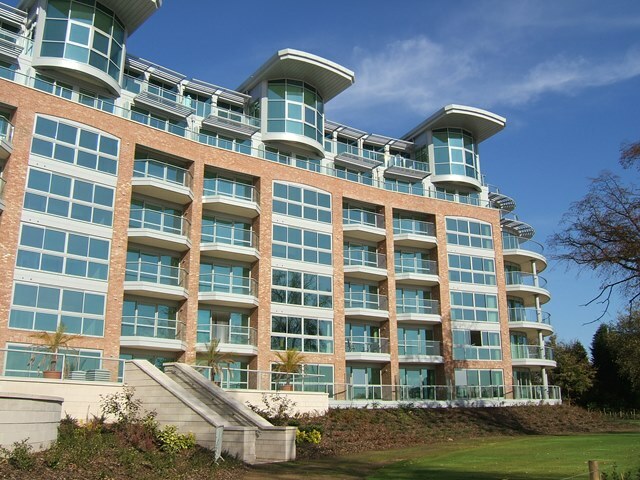 The balconies are enhanced by distinctive curved steels, a design feature that ‘connects with the sea’, complementing the contours of the eye-catching corner tower. This tower also houses the living rooms of five of the homes and the master bedroom of the two-storey penthouse apartment with its sweeping curved balustrading. Balcony Systems supplied more than 300 metres of curved and straight glass balustrading featuring their proprietary ‘Royal Chrome’ handrail finish for the distinctive property, built by private developer Hamlet Homes Ltd.
Hamlet Homes specified the durable anodised aluminium Royal Chrome finish – specially-developed by Balcony Systems – for its corrosion-resistance and virtually maintenance-free characteristics. Almost identical in appearance to polished stainless steel, but with none of the drawbacks, the Royal Chrome handrail is an ideal choice for coastal climates. 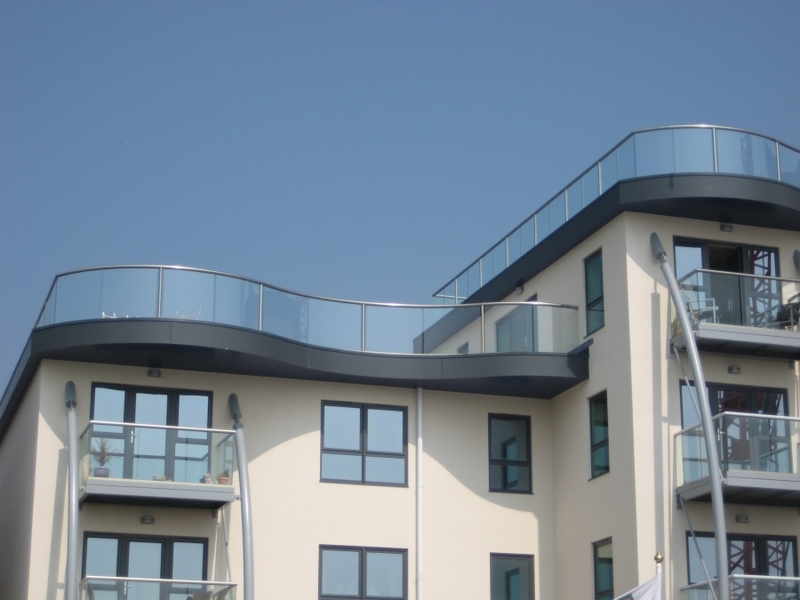 Balcony introduced this special finish following clients’ requests for a long-life product with the smart look of stainless steel. 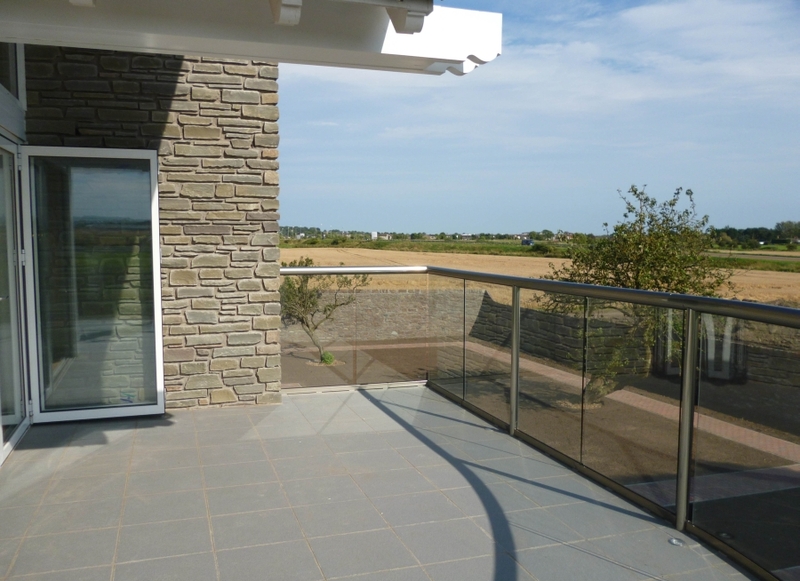 Mike Neale, Estimator and Buyer at Hamlet Homes, explained: “Seven years on, the balustrading with the Royal Chrome handrail supplied by Balcony Systems still looks very good. It has certainly demonstrated its robustness and longevity in a testing marine environment. 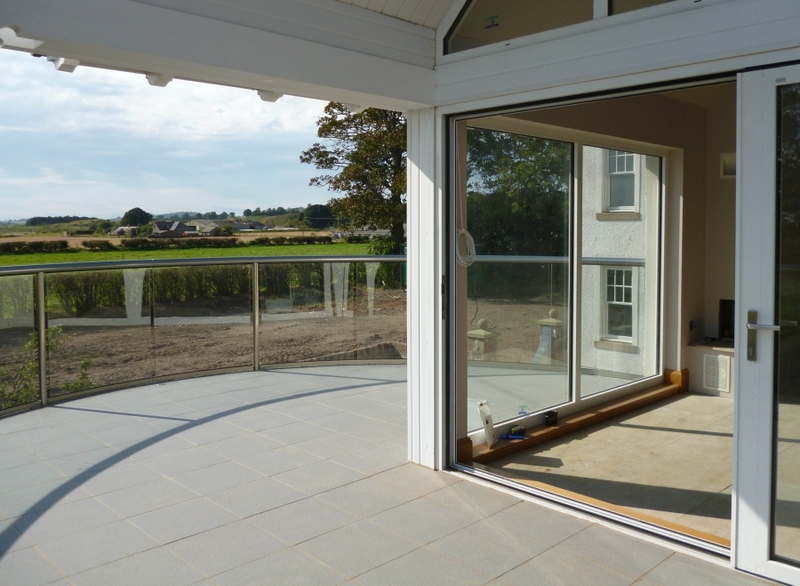 Mike continued: “We were originally going to use stainless steel balustrading, but decided on Balcony Systems after their curved patio doors and balustrading caught my eye while researching them on the internet. 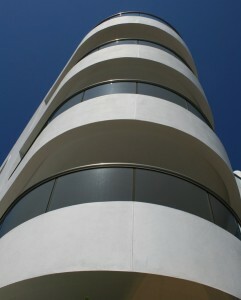 The curved balcony on the penthouse apartment really adds to the flowing lines of the building. 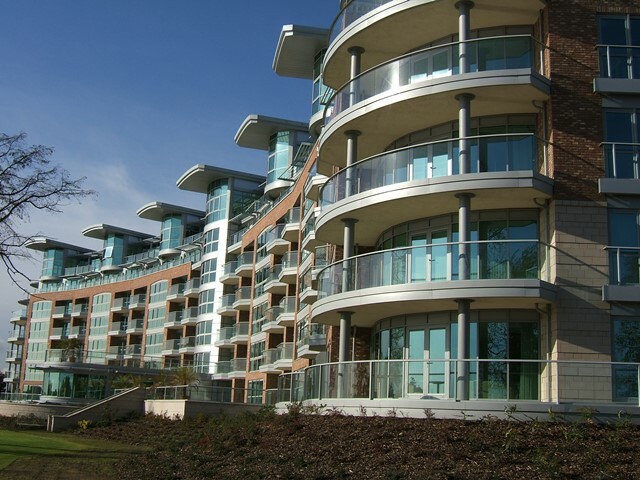 Some 1,400 metres of the Balcony 2 System Glass Balustrade (using Balcony Systems’ Aerofoil shaped handrail) were specified to create sweeping curved glass balconies on this impressive and prestigious development. Balconies, and glass in particular, have become an important and appealing feature of buildings, particularly for apartment developments where they allow purchasers comfortable access to enjoy fresh air and surrounding views. As an integral and aesthetic aspect of domestic architecture, their appearance also plays a key role in a property’s visual appeal, helping to secure sales. 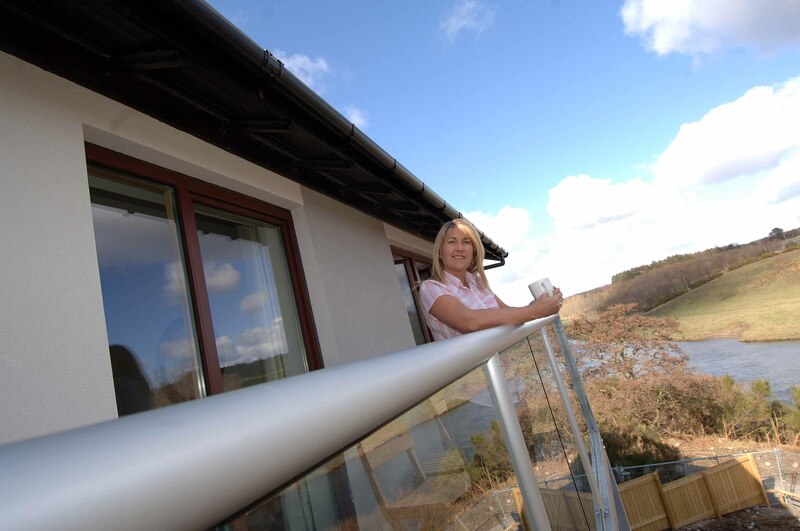 Consequently, modern balcony styles now favour glazed systems, rather than railings or spindles, to retain clear panoramic views of surrounding scenery. Using low-maintenance materials, such as glass and aluminium, also has the added advantage of requiring almost no regular and costly maintenance to keep the structure looking as good as new. 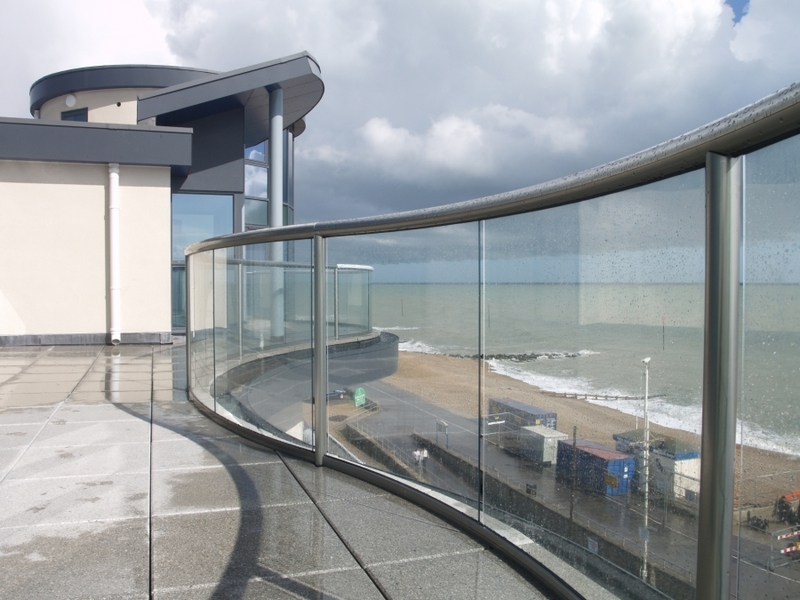 Innovation and development in balcony design has resulted in a beautiful, yet cost-effective system available on the British market that replicates the look of structural glazing for both curved and straight balustrading solutions. 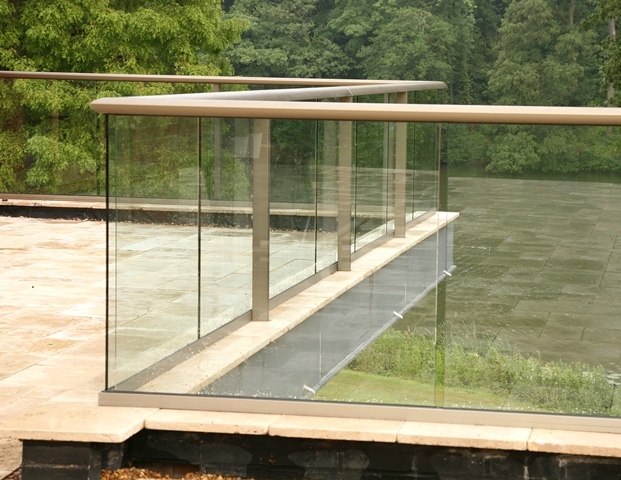 As the Balcony system relies on the handrail to provide the required strength, in many cases the glass balustrades require no vertical supports to provide an uninterrupted view. This was the key reason why the system was requested and specified for Trent Park by the client, built to the east of Nottingham city centre. 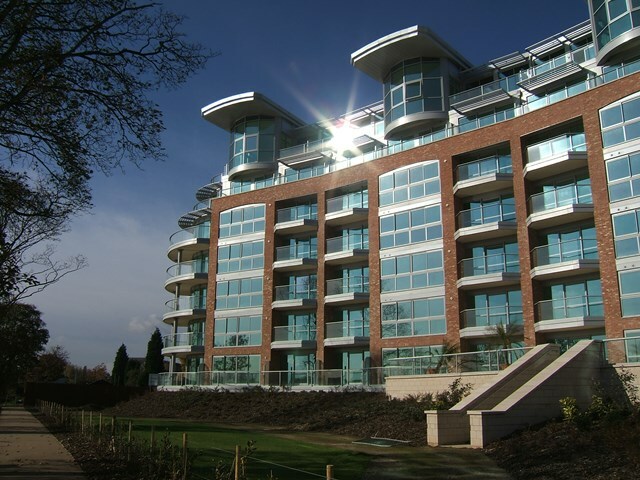 Balcony Systems supplied the specialist balustrading solution for 146 luxury one to three-bedroomed apartments to take advantage of spectacular riverside views. The result delivered the client’s vision for an aesthetically-driven balustrading solution that is as visually stunning as it is practical. Technical expertise and knowledge was essential at all stages of the project, from initial design concepts right through to overseeing installation of nearly 1,400 metres of straight and curved glass balconies. 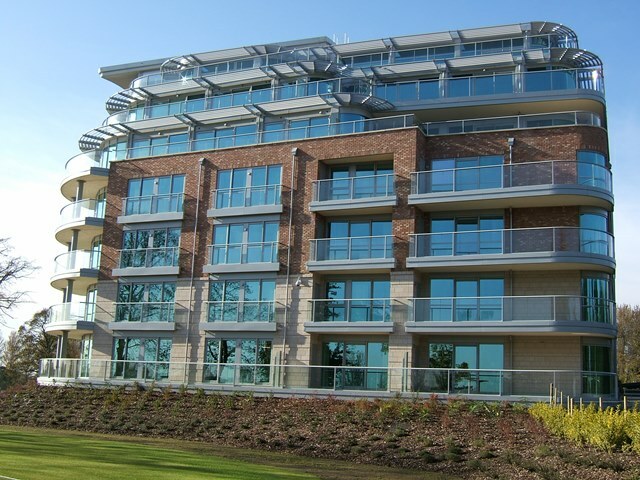 Sweeping curved glass balconies follow the building’s rounded lines on the larger apartments, allowing for unobstructed views across the landscaped grounds and enhancing light through the full height windows. 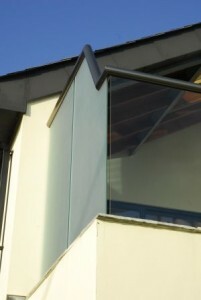 The system’s versatility allowed for specialist adaptation to suit the fixings and edge installation. 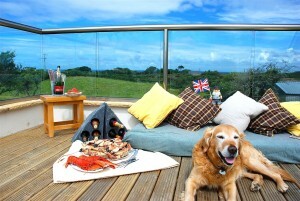 Waterproofing was also taken into account with the balcony installation interfacing with the cladding system. The system is suitable for all types of applications, being compatible with timber, steel, stone, brick and concrete walls. As the toughened glass panels are held securely at the base and handrail, there are no clamps, clips or ‘lugs’ to spoil the clean lines. 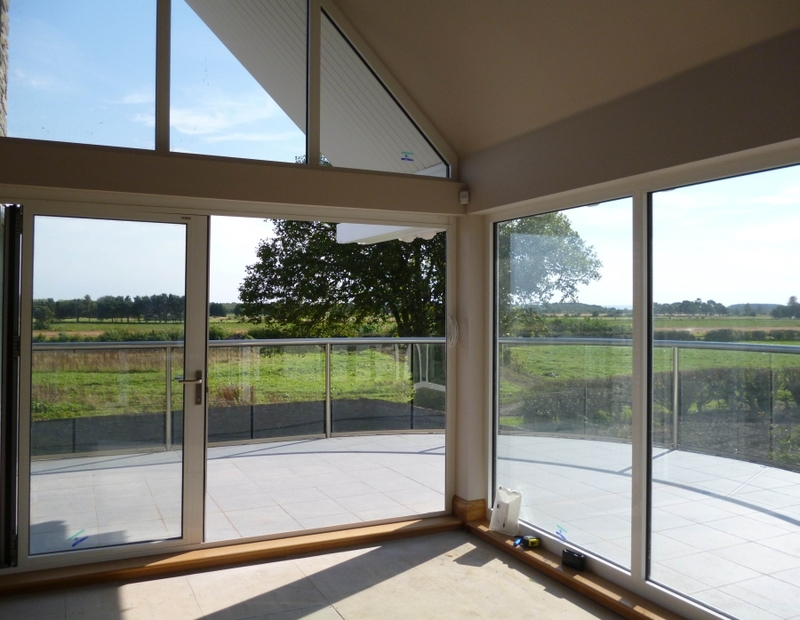 Straight and curved glass balustrading from Balcony Systems retains open views overlooking surrounding countryside and complements the contemporary style of this Scottish executive newbuild home. 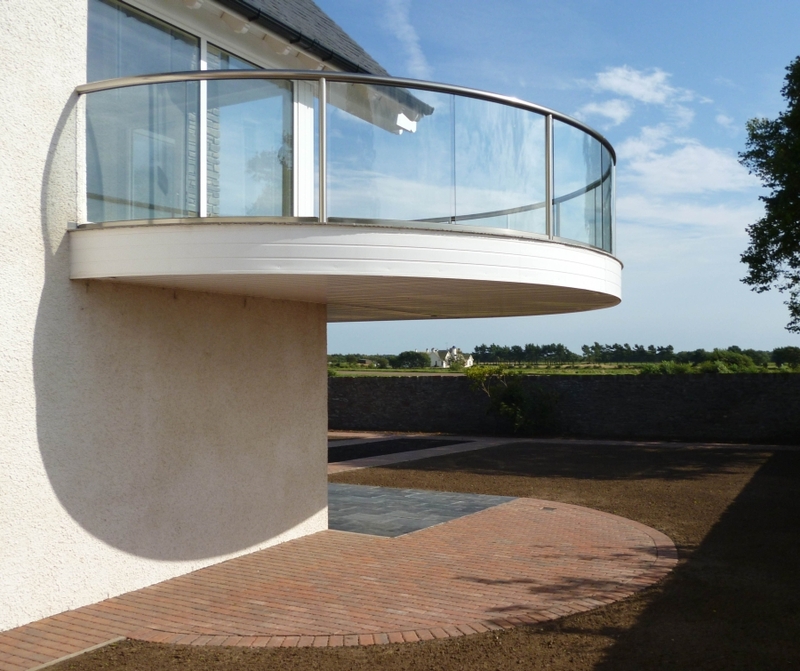 More than 20 metres of clear glass balustrading with Balcony’s proprietary ‘Royal Chrome’ handrail finish were installed at the five-bedroomed property in Barry, Carnoustie, located close to the world-famous golf course. It was built by construction division of D J Laing Group for its Managing Director David Laing. 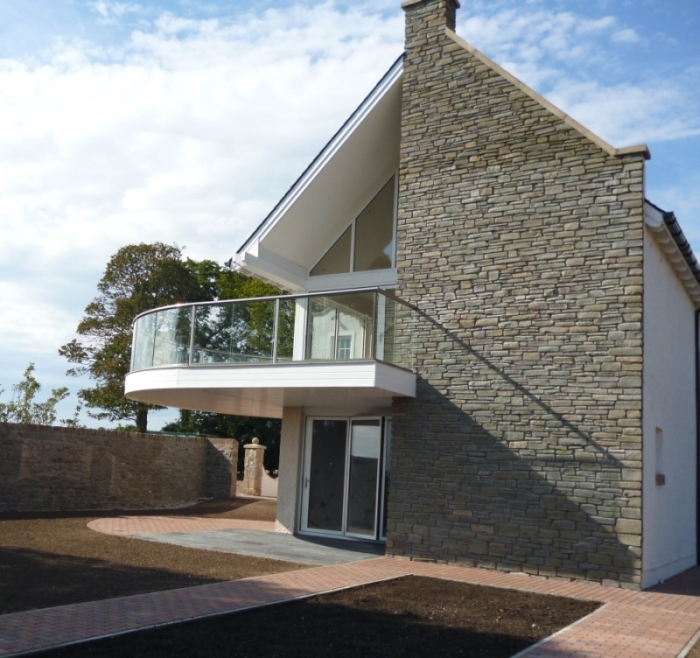 Balcony’s Approved Installer Simon Elms fitted the balustrading to the curved cantilevered balcony and straight-edged terrace leading off a first-floor living room above a cinema and games room at Barry Manse, named after the now demolished former Manse on the site. Requiring minimal maintenance, the clear glass panels provide the necessary safety while keeping uninterrupted views – with the added bonus of protection from the wind on gusty days.